The big question is how this African resident got to Jodhpur, as it is not known to migrate outside of Africa. We hope that bird experts can come up with a theory about the possible reason for its sighting at Jodhpur in India. The Pied Crow (Corvus albus) is a widely distributed African bird species of the crow genus. Presently its conservation status is Least Concern (LC). 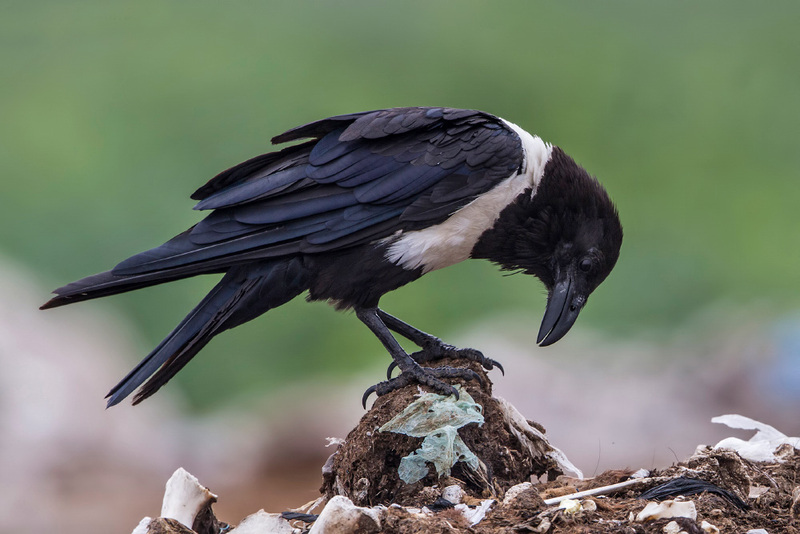 On 13th August 2017, Mr. Vinod Puri Goswami, Mr. Digvijay Singh Rathore and I witnessed and photographed a single Pied Crow together with few Common Ravens (Corvus corax) and House Crows (Corvus splendens) at a cattle carcass dump about 20 kms from Jodhpur city. This sighting may be the first documented wild sighting from India. The big question is how this African native bird got to Jodhpur, as it is not known to migrate outside of Africa. The nearest record (to India) outside Africa is from Socotra Island of Yemen in the Arabian Sea. So the bird might have escaped from captivity (zoo/cage) or perhaps arrived on board a ship coming from Africa — a ‘ship assisted’ vagrant — though a highly unlikely scenario. However, the (African) Pied Crow is a popular cage bird because of its intelligence, as seen in many YouTube videos. We haven’t heard of the Pied Crow being kept as a pet or zoo bird in India. However, we would like to hear from others regarding its status as a cage or zoo bird in India or even Pakistan. The Pied Crow was observed to be keeping a distance from us and not behaving like a pet bird. Hope the experts will come up with a theory about the possible reason for its sighting at Jodhpur in India. Pranjal is a superintending geologist, Oil India Limited, Jodhpur.